Containers are stateless by nature and likely to be short-lived. They are quite ephemeral than VMs. What it actually means? Say, you have any data or logs generated inside the container and you don’t really care about loosing it no matter how many times you spin it up and down, like HTTP requests, then the ideal stateless feature should be good enough. BUT in case you are looking out for a solution which should record “stateful” applications like storing databases, storing logs etc. you definitely need persistent storage to be implemented. This is achieved by leveraging Docker’s volume mounts to create either a data volume or a data volume container that can be used and shared by other containers. 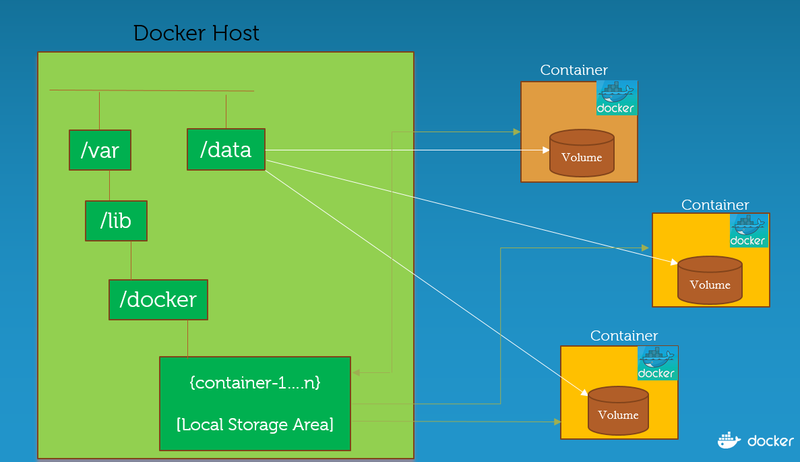 In case you’re new to Docker Storage, Docker Volumes are logical building blocks for shared storage when combined with plugins. It helps us to store state from the application to locations outside the docker image layer. Whenever you run a Docker command with -v, and provide it with a name or path, this gets managed within /var/lib/docker or in case you’re using a host mount, it’s something that exists on the host. The problem with this implementation is that the data is pretty inflexible, which means anything you write to that specific location, yes, it’ll stay there after the container’s life cycle, but only on that host. If you lose that host, the data will get erased. This clearly means that the situation is very prone to data loss. Within Docker, it looks very similar to what shown in the above picture, /var/lib/docker directory structure. Let’s talk about how to implement the management of data with an external storage. This could be anything from NFS to distributed file systems to block storage. In my previous blog, we discussed about Persistent Storage implementation with DellEMC RexRay for Docker 1.12 Swarm Mode. Under this blog, we will look at how NFS works with Swarm Mode.I assume that you have an existing NFS server running in your infrastructure. If not, you can quickly set it up in just few minutes. I have Docker 1.12 Swarm Mode initialized with 1 master node and 4 worker nodes. Just for an example, I am going to leverage a Ubuntu 16.04 node(outside the swarm mode cluster) as NFS server and rest of the nodes( 1 master & 4 workers) as NFS client systems. There are two ways to setup NFS server – either using available Docker image or manually setting up NFS server on the Docker host machine. As I already have NFS server working on one of Docker host running Ubuntu 16.04 system, I will just verify if the configuration looks good. I created the following NFS directory which I want to share across the containers running the swarm cluster. As shown above, we will be sharing /var/nfs directory among all the worker nodes in the Swarm cluster. Great ! Let us cross-check if the configuration holds good. As shown above, we have NFS server with IP: 10.140.0.7 and ready to share volume to all the worker nodes. The docker volume inspect <vol_name> rightly displays the Mountpoint, Labels and Scope of the NFS volume driver. Let’s verify if one of worker node can see the created file. Hence, we implemented persistent storage for Docker 1.12 Swarm Mode using NFS. In the future post, we will talk further on the available storage plugin and its implementations.